Overall, every four to five years Russian universities award some 20 bachelor’s and master’s degrees in Thai, whereas the number of Thai students coming to Russia to study the Russian language and get a degree at Russian universities is scores of times as many. Compared with a constantly growing interest in the Chinese language and a corresponding growth in the opportunity to learn it (language classes, specialised schools, university programs, Confucius Institutes), pursuing a serious interest in the Thai language in Russia is not that easy. Yet if we look at this issue from another angle, the variety of Thai-language program offered by Russia’s four leading universities presents a far more upbeat picture of Thai studies in Russia. Currently, at professional level, Thai is taught at the Moscow State Institute of International Relations (MGIMO), at the Institute of Asian and African Studies under Moscow State University, at St. Petersburg State University, and at the Far Eastern Federal University. MGIMO was the first Russian university to offer a Thai language program, with its first Thai group set up in 1954. The author of the first Thai-Russian dictionary, which was published in 1964, Lev Morev, worked there for many years. The dictionary has some 26,000 words and continues to be Russia’s only dictionary of this kind. A Russian-Thai dictionary comparable in content and scope was published in Bangkok only in 2011. The 1950s-60s was a period of growing interest in regional studies in the former Soviet Union. At the time, studying Southeast Asian countries was not unlike venturing on a journey into a terra incognita for Soviet scholars. It was then that the foundations of comprehensive academic studies of Thailand were laid at the Institute of Oriental Studies at the Russian Academy of Sciences in Moscow. In 1956, a Thai-language program was set up at the Institute of Asian and African Studies. The institute, which structurally forms part of Moscow State University, continues the tradition of Asian studies first established back in the 19th century. In 1961, a Thai philology section was set up at the Oriental Studies Department of St. Petersburg State University. It was there that one of Russia’s most prominent scholars in Southeast Asian literature, Yury Osipov, carried out his research. He taught himself Thai, and also the Chinese, Burmese and Laotian languages. Finally, in 1999 the first Thai-language group was launched at the Far Eastern State (now Federal) University. Each of the four universities specialises in a particular aspect of Thai language and regional studies. At MGIMO, the emphasis is on political and current affairs translation, essential for future diplomats. Still, considerable attention is also paid to literary language, including fiction works by Kukrit Pramoj and Siburapha, as well as modern authors. Many MGIMO graduates work at Russian diplomatic missions in Thailand or at the UN Economic and Social Commission for Asia and the Pacific, whose headquarters is in Bangkok. At MGIMO, Thai is taught by Lyudmila Larionova, who is proficient in various aspects of the language, including the royal vocabulary. During the visit of Her Royal Highness Princess Maha Chakri Sirindhorn to Russia in 1993, it was Lyudmila Larionova who acted as her interpreter from the Russian side. At the Institute of Asian and African Studies, the Thai language forms an integral part of in-depth studies of the history and socio-economic development of Thailand. Graduates of this institute often work at the Russian Foreign Ministry and in business. 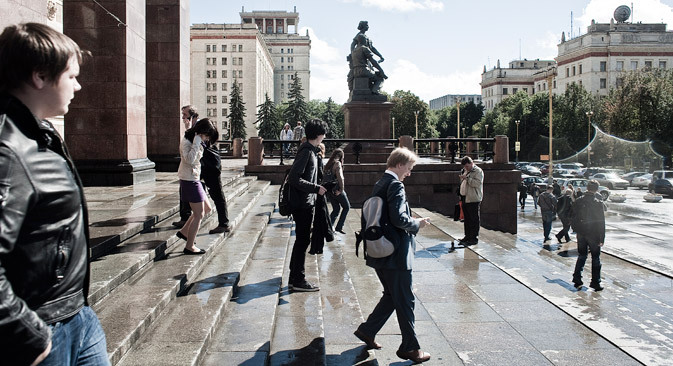 The St. State Petersburg University pays particular attention to historical, linguistic and cultural studies. Some of its graduates pursue academic and teaching careers, others work at the Russian branch of the Tourism Authority of Thailand, in business structures in Russia (the CP Group representative office) and in Thailand. St. Petersburg is inexorably connected with the history of friendship between Russian Tsar Nicholas II and King Rama V, who visited that city in 1897 and left his son there to be trained in the Page Corps. The launch of a Thai-language program in Vladivostok came in response to the demands and challenges of the modern day. Without having highly-qualified experts in the Far East, who have in-depth knowledge of Asia-Pacific countries and speak the relevant languages, Russia can hardly hope to expand its cooperation with that region. First published in RBTH print supplement published with The Nation newspaper in Thailand in April 2014.